1. Blackstone Real Estate Income Trust Inc. paid $11.65M to acquire student housing complex The District on 5th, a 208-unit complex at 550 N. Fifth Ave, Tucson. It has 764 beds for rent in models with one, two, three and four bedrooms. The purchase was part of a $1.2B buy Blackstone made of EdR Student Housing Portfolio in a joint venture with Greystar Real Estate Partners. 2. The Chase Tower in downtown Phoenix was sold for $107.5M, six months after it was bought at a trustee sale for $78.8M. According to Maricopa County Recorder documents, Viola Lordsmeer LP bought the building from 201 North Central Avenue Property LLC, a joint venture between Wentworth Property Co. and Taconic Capital Advisors LP. 3. Newmark Knight Frank Retail Capital Markets team announced the $44.8M sale of Palm Valley Pavilions West, a 98.5 percent leased 232.6KSF shopping center in Goodyear. The team led by Pete Bethea, CJ Osbrink, Rob Ippolito and Glenn Rudy represented the seller, Retail Value Inc. The buyer, a joint venture between DRA Advisors and Pine Tree, was self-represented. 4. DSW Commercial Real Estate purchased Campbell Plaza shopping center in Tucson for $33M with its partners at Iridius Capital and JCR Capital. Mark Lucescu of Lucescu Realty represented the seller, The Krausz Companies. James Hardman of DSW Commercial Real Estate represented the buyer. Tim Storey of Newmark Realty Capital secured the equity and debt financing for the acquisition. 5. CBRE arranged $16.8M in financing for the acquisition of a two-property office portfolio consisting of three buildings in metro Phoenix. Bruce Francis, Dana Summers, Doug Birrell, Bob Ybarra and Shaun Moothart represented the borrower, an institutional investor based in Kuwait. Property Income Advisors, Inc. represented the buyer. The first office site is the 115KSF Cotton Center I in Phoenix. The second property, 2552 West Erie Drive and 2801 South Fair Lane in Tempe, is comprised of two buildings and totals 60.8KSF. 6. Velocity Retail Group’s Darren Pitts represented At Home in the purchase of the former Sam’s Club at 15255 N. Northsight Blvd., Scottsdale. The building totals 129.5KSF on approximately 13.1 acres. 7. The Palomino Crossing Apartments, at 750 East Irvington Road, Tucson, sold this month for $13.75M. The NorthMarq Multifamily team of Bill Hahn, Trevor Koskovich, and Jesse Hudson represented both the seller and the buyer. 8. Cushman & Wakefield announced Capstone Advisors purchased First Rose Garden Commerce Center, two multi-tenant industrial buildings totaling 73.3KSF. CALCAP Advisors Inc. sold the Phoenix property for $6.64. Steve Lindley, Bob Buckley, Tracy Cartledge and John Pompay of Cushman & Wakefield’s Phoenix office negotiated the transaction on behalf of the seller. 9. 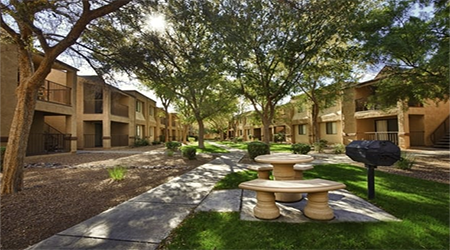 Marcus & Millichap announced the sale of El Dorado Apartments, a 33-unit apartment property in Scottsdale. The asset sold for $5.78M. Richard Butler and Sean Connolly, investment specialists in Marcus & Millichap’s Phoenix office, represented the seller, an out-of-state limited liability company. 10. Velocity Retail Group completed the $2.9M investment sale of two ground leased properties at the Heritage Square shopping center in Queen Creek. The center is a joint venture between Wadsworth Development Group and Accelerated Development Services. Velocity Retail Group’s Dave Cheatham, Darren Pitts and Eli Castronova represented the seller, Wadsworth Queen Creek, LLC. The buyer, Trevellyan Investment Company L.P. was represented by Brandon Trevellyan, from Capital Real Estate Ventures, Inc.
11. Cushman & Wakefield announced Dr. Remus Repta (Repta Properties, LLC) purchased Scottsdale Medical Building. 6 Turns, LLC sold the property $3.4M. Sheila Bale, Ryan O’Connor and Tom Weinhold of Cushman & Wakefield’s Phoenix office negotiated the transaction on behalf of the buyer. The Phoenix Kidder Mathews healthcare team of Michael Dupuy and Rachael Thompson negotiated the sale on behalf 6 Turns, LLC. 12. A California investor purchased the office building at 4745-4753 E. Camp Lowell Drive in the Swan Corporate Center in Tucson for $2.7M. Mark Hays and Patrick Teske of Tierra Antigua represented the seller, Baldunn Investment Company, LLC. Tom DeSollar of Arizona First Properties, LLC negotiated the sale for the buyer, Acosta Farm Properties, LLP. 13. Ray Cashen of Cashen Realty Advisors recently closed a deal for $2.5M at 6316 N. 7th Street for an 83KSF parcel slated for commercial development. Aspirant Development was the buyer, and The Zunick Trust was the seller. Cashen was also recently involved in a deal in which a 16.5KSF building at 4522-4536 N. 7th Street sold for $2.5M. 14. Heslin Holdings, Inc. added 35.8KSF of retail building in Tucson when it purchased the former Safeway store at 5548 E. Grant Road from Albertson’s for $2.5M. Pat Darcy of Tucson Realty & Trust Co. in Tucson represented the seller, Safeway, and Wesley Connolly of Matthews Retail Advisors represented the buyer. The acquisition is part of Heslin’s larger plan to invest $75M in retail properties over the next year and is the fifth in a series of similar acquisitions. 15. Royal Suites Park, a two-story, 29.5KSF office building at 3233 West Peoria Avenue in Phoenix, has sold for $2.05M to Page Holdings, LLC. Kidder Mathews commercial real estate broker Jenette Bennett represented Page Holdings, LLC in the transaction. The seller was Viel Gluck, LP and Far Marel, LLC. 16. Parkway Village, a 16.6KSF shopping center at 15605 and 15633 West Roosevelt Street in Goodyear, has sold for $2M. Kidder Mathews commercial real estate broker Jenette Bennett represented the seller, Parkway Village Partners, LLC. The buyer was Simplified Properties, an NNN leased investment group. 17. Waste Management purchased a 12.74 acre property located in Glendale from Total Transit. The property, 4600-4610 W. Camelback Road in Phoenix, includes 63KSF of office and warehouse in four buildings. Lee & Associates’ Chris McClurg, Ken McQueen and Brian Payne represented Waste Management in the transaction, which was negotiated on behalf Total Transit by James Cohn, Pat Feeney, Danny Calihan and Rusty Kennedy of CBRE. No transaction amount was given in the announcement, but value is estimated at roughly $6M. 18. The Anthem Eastside Shops at 3668-3720 W. Anthem Way have been sold to Southgate Mall Associates of Missoula, MT. The property was purchased from Irvine Asset Group, LLC. 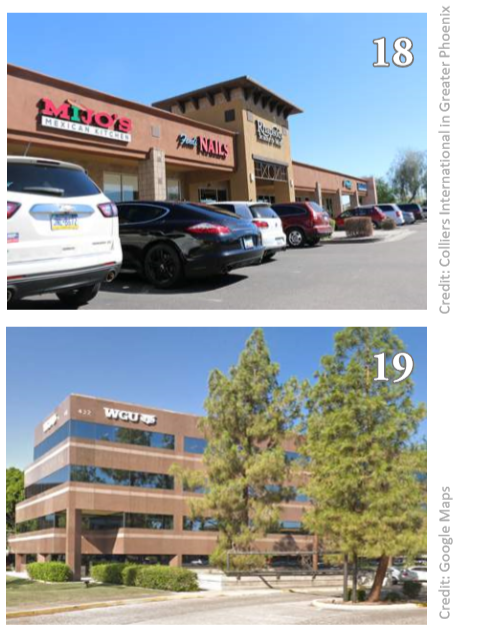 Mindy Korth, Kirk Kuller and John Jackson of Colliers International in Greater Phoenix negotiated the 1031 exchange sale, which was handled as an off-market transaction. No dollar amount was given. 19. Care1st Health Plan Arizona, which is owned by WellCare Health Plans, Inc., will open its new hub at the Phoenix Gateway Center, 432 N. 44th St. It will occupy the first three floors of the Two Gateway building. No square footage or lease rate were listed.